TenniStar returns this summer to Bethesda Sport & Health for another great season. 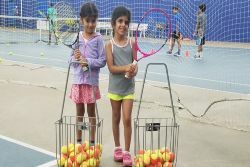 Campers stay cool and dry on our indoor, air-conditioned courts and also enjoy playing outdoors on the rooftop courts. Campers rotate between the two areas, weather permitting. Instructor rations are kept low, and there is a balance of stroke development, games and drills. Click on the appropriate week and time of day in the table below. Complete the brief enrollment form and pay instantly online. Alternatively, send a check made out to "TenniStar Sports" to 2813 East-West Highway, Chevy Chase, MD, 20815. Daily registration is accepted; please call the office for details and any questions. Sport&Health members may take 10% off their enrollment fee for any full-week program. Register online but don't pay. Instead, e-mail the office requesting an online payment link that reflects the discounted rate. Please note there is no member discount on the per-diem rate. If you cannot wait until summer time, check out our Sport & Health page to learn about indoor clinics in the spring! Clinics are directed by Mitch Henkin and/or Steve Parker at both The Promenade and Bethesda Sport&Health. Call us at 301-530-5472 to register or for information about times, fees, and specifics. Instruction is for current and future tournament players and high school tennis team members. All interested players must be approved by the TenniStar office. Minimum enrollment levels are required for each week. Campers must bring their own racquet, and all-day campers must bring lunch. Need your racket strung? We offer racket restringing at the Promenade Tennis Club in Bethesda. Contact us at 301-530-5472 for details.